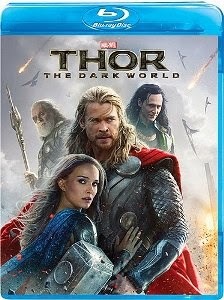 In anticipation of this week’s release of Captain America: The Winter Soldier, the timing was perfect to revisit last fall’s Thor: The Dark World on Blu-ray. Though I pretty much covered my feelings on the movie in my theatrical review, I have to say: the Capt. America sequel has its work cut out for it. The Dark World was the first non-Iron Man sequel in the Avengers cycle and it handily outdoes both of those Tony Stark solo outings. Perhaps 2010’s Iron Man 2 was a bit rushed following the unexpectedly phenomenal response to the 2008 original Iron Man. It didn’t have too many dots to connect within the franchise, seeing as The Incredible Hulk (2008) – somewhat of a ‘black sheep’ in the Avengers series – was the only related film at the time. It huffed and puffed, but couldn’t escape a general air of pointlessness. There was no excuse, however, for the mediocrity of 2013’s Iron Man 3, which followed the previous year’s stratospherically successful The Avengers, directed by Joss Whedon. That vague, ‘shaggy dog story’ feeling was back. Iron Man 3 seemed only tangentially connected to the overall Marvel Universe – a disappointment given the explosion of possibilities that followed in the wake of Whedon’s epic. The Dark World, on the other hand, not only delivers on just about every level, it expands the intergalactic elements introduced in The Avengers. Though we don’t hear from Nick Fury or anyone S.H.I.E.L.D. related, the invaluable presence of Loki (Tom Hiddleston) and his on-going love/hate relationship with brother Thor (Chris Hemsworth) makes the film a viable sequel to both The Avengers and the first Thor (2011). Brilliantly sidestepping the typical “hero/villain go head-to-head and smash things up” superhero clichés, The Dark World is densely plotted and requires that attention be paid as the story unfolds. Director Alan Taylor and a trio of screenwriters have a lot to convey, initially seeming to overstuff the film’s 112-minute running time. But upon repeat viewing, it becomes clear that The Dark World offers a well planned, authentically comic book-esque viewing experience, one in which no time is wasted. Sure, there’s plenty of exposition – Odin’s (Anthony Hopkins) opening monologue tells us everything we wanted to know but were afraid to ask about the Dark Elves. That opening alone contains enough plot to justify its own feature film. Taylor handles the transitions between Asgard , the various other Realms (including the Dark Elves’ Svartalfheim), and Earth with aplomb. Thor is in the thick of Malekith’s (Christopher Eccleston) plot to restore darkness to the universe via a weaponized matter known as Aether. 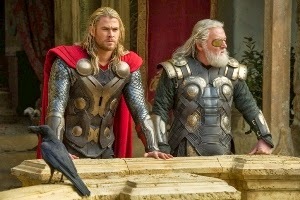 But the hammer-wielding hero is part of an ensemble, with Hemsworth admirably acting as a team player. He doesn’t dominate the proceedings the way, say, Robert Downey Jr. does in the Iron Man films (not that I don’t love Downey’s performances). As the Nine Realms approach a rare state of convergence – during which they will be joined by inter-dimensional portals – Malekith seeks to unleash the Aether, which has been discovered by Jane Foster (Natalie Portman) on Earth (in London) via one such portal. In fact, the substance has infiltrated her body, rendering her capable of great destruction but also instability (inching her closer and closer to death as she is overwhelmed). Meanwhile, Loki has been imprisoned by Odin on Asgard for his actions on Earth (as seen in The Avengers). Hiddleston is better than ever, playing Loki precisely on the edge of good and evil – stealthily making sure we never know which way he will go, especially when tasked by Thor to help fight the Dark Elves (and save Jane). Also returning from the first film are Dr. Erik Selvig, nuttier than ever following his mind-control victimization in The Avengers, and Jane’s intern Darcy (Kat Dennings, stealing every scene she’s in). Yeah, it’s a ton of plot elements to juggle (and I haven’t even mentioned Frigga, Thor and Loki’s mother – again played by Rene Russo, and her struggle to understand her wayward adopted son, Adewale Akinnuoye-Agbaje as Malekith’s fearsome right-hand man Kurse, and even Chris O’Dowd as Jane’s blind date). The multi-Realm climax – in which Thor finds himself boarding a Greenwich-bound subway at one point – is terrifically inventive, at times even evoking the zany surrealism of Being John Malkovich (specifically the chase through Malkovich’s subconscious). In my theatrical review, I complained there was simply too much plot. But I am definitely revising that opinion to point out that it’s precisely the complexity of the plot that makes The Dark World so re-watchable. As would be expected, The Dark World’s Blu-ray specs are tremendous, offering stellar image quality and a fully immersive DTS-HD MA 7.1 mix. The increased budget (over the 2011 original) obviously allowed for far better visual effects, all of which are rendered with pristine clarity and detail. And the sound design, coupled with Brian Tyler’s supercharged score, is intricate throughout. A sort of ho-hum special features package includes a rather clinical audio commentary by director Alan Taylor, cinematographer Kramer Morgenthau, Marvel honcho Kevin Feige, and costar Tom Hiddleston. “A Brother’s Journey: Thor & Loki” is a half-hour featurette, divided in two parts, that basically summarizes the two characters’ story thus far, featuring too many clips from Thor, Avengers, and Dark World. Eight minutes of deleted and extended scenes offer a few cool bits, a gag reel is less funny than it should be, and Brian Tyler talks for five minutes about scoring the film. The best feature is the new Marvel One Shot: All Hail the King (14 minutes), focused on Ben Kingsley’s Iron Man 3 character, Trevor Slattery. Can’t wait for Captain America: The Winter Soldier to see if Marvel can add another great sequel to the Avengers series. Thor: The Dark World is a tough act to follow – if you’ve been putting off checking it out for whatever reason, wait no longer.